Just how exactly does one put Rome into words? Even if I narrow it down to “food in Rome”, it is still an overwhelming task. Having just returned from a week in Italy and placing a magnificent check-mark next to one of my upper-tier bucket list items, I find myself trying to pick just the perfect pictures and words to do it justice. 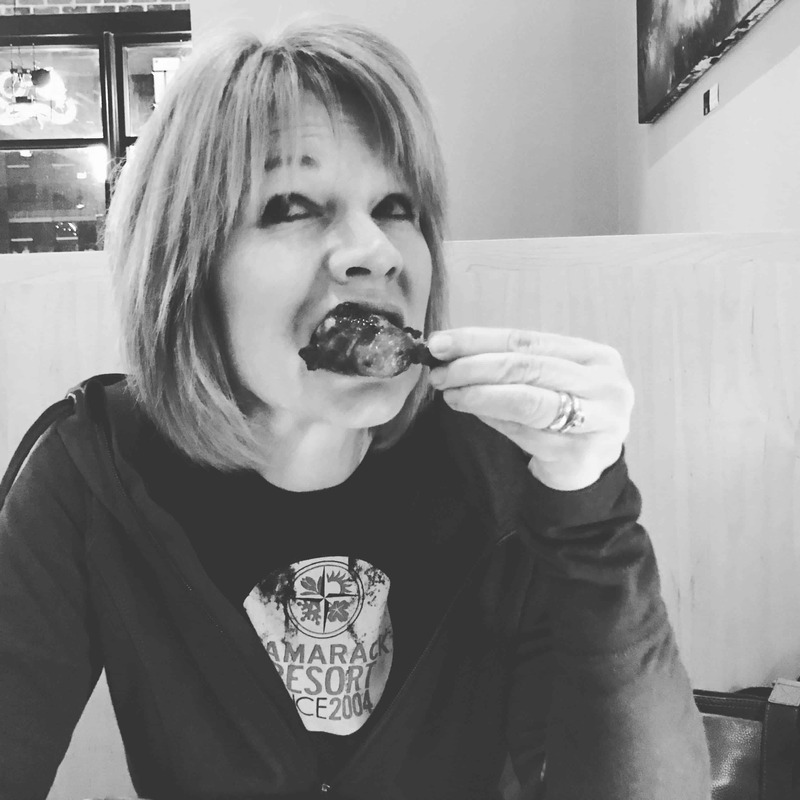 The story could be told chronologically, or by food type, or even through recommendations and reviews. 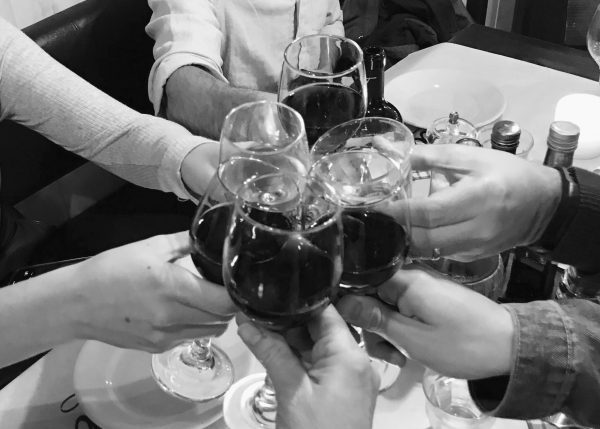 But it has to be so much more than just a retelling of what we did … it needs to be a collection of food related experiences and lessons. I have more than enough material because I took advantage of every opportunity to ask questions, sample the unfamiliar, and learn from “mistakes” made along the way. The first thing you need to know is my new favorite word: Mangia! LESSON: Carbonara is the new pasta dish-of-choice in our family. 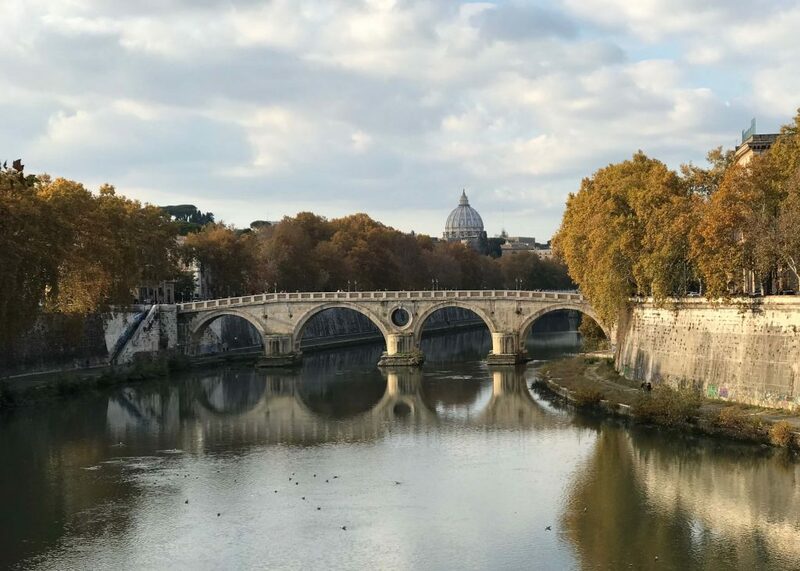 Our youngest son has been in Rome since August, spending a semester studying Graphic Design. He “discovered” carbonara soon after the semester began and quickly started making it for himself. Wanting to try something new but not taking too much of a risk, four out of six of us followed him in ordering it and the two of us that didn’t, wished we had. 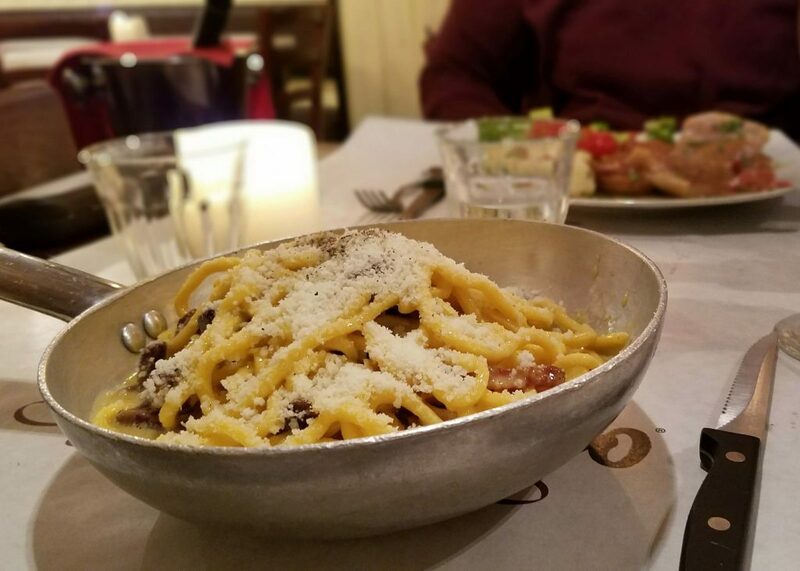 What we ordered was delicious, but the carbonara was just that good! 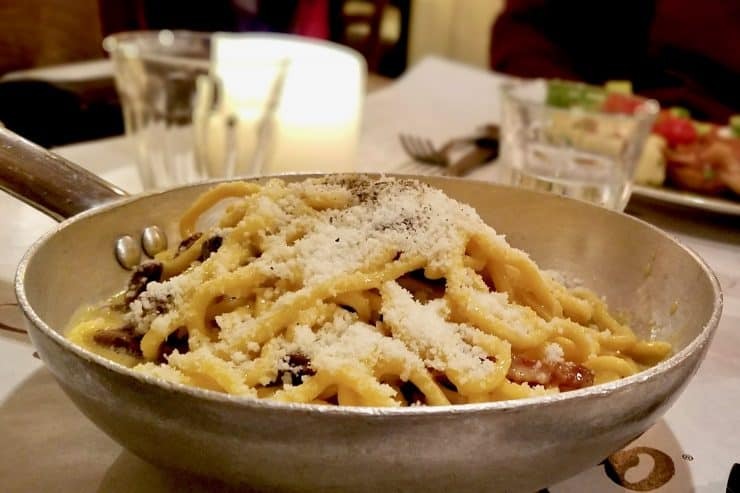 It’s a simple dish made with pasta similar (and yet not) to spaghetti, guanciale (pork cheek), eggs, Romano and Parmesan cheese, salt, and pepper. Simple … but impressive. I’m not sure if it was the third or fourth time we had carbonara on the trip when an important tip was revealed to us: more egg yolk (4) than egg white (1). If the recipe you decide to try doesn’t follow this tip, look for another one. We left our son at the end of the week and that very night he made … you guessed it … carbonara with the egg adjustment. If you are lucky enough to be invited to the kitchen to see a wood-fire oven and pasta being made by hand, you have found authenticity. Chicago has deep dish. New York has giant, thin slices you fold in half lengthwise. Pepperoni is a staple for pizza everywhere … well, not EVERYwhere. Certainly not in Rome … blew my husband’s pepperoni-with-tomato-sauce-and-mozzarella-lovin’-mind. If you ask for pepperoni pizza in Italy, do not be surprised when you get a pizza LOADED with peppers … like bell peppers. 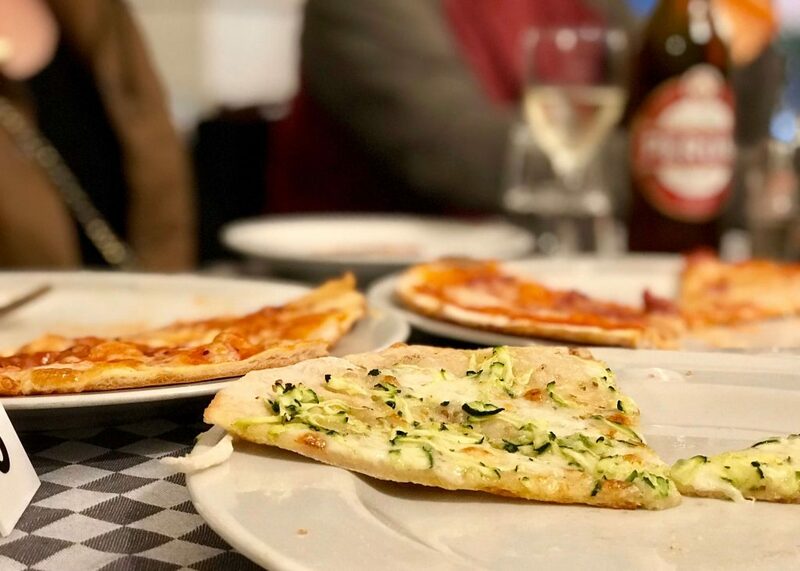 So what is pizza like in Rome? I am a researcher at heart and I know that the results are only as good as the sample size. I couldn’t come back and report to you on pizza after only trying one or two slices … or one or two pizzerias. I’m devoted like that. 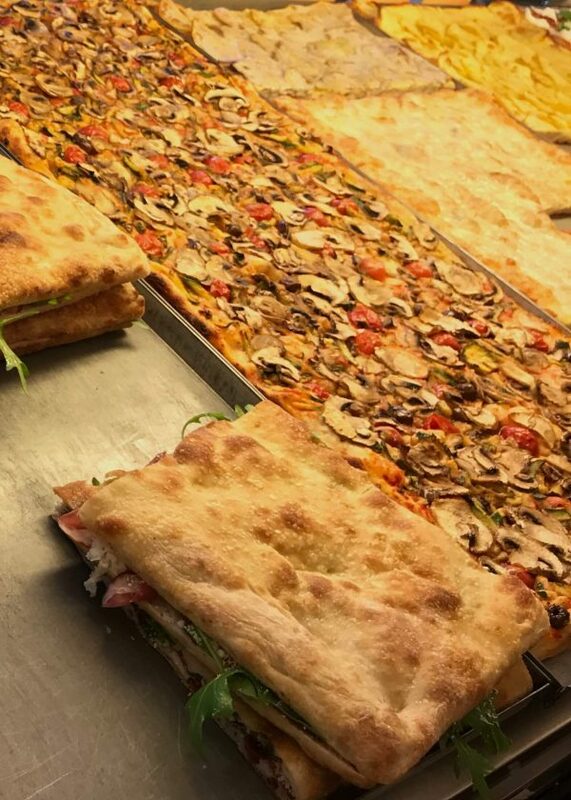 We ate pizza all week … breakfast, lunch, dinner, dessert … by the slice and whole pizzas … square, round, “sandwiched”. In my extensive research, I found two types of crust: thin, crispy, wood-fired and a slightly thicker, but not dense, focaccia-style. Toppings are kept simple and feature a lot of vegetables (zucchini, mushrooms, artichokes, tomatoes, fennel, and potatoes). Sauce and cheese are minimal but of high quality and flavor. My personal favorite was tomato and green olive pizza on the focaccia-style crust. I should say that was my favorite non-dessert pizza. 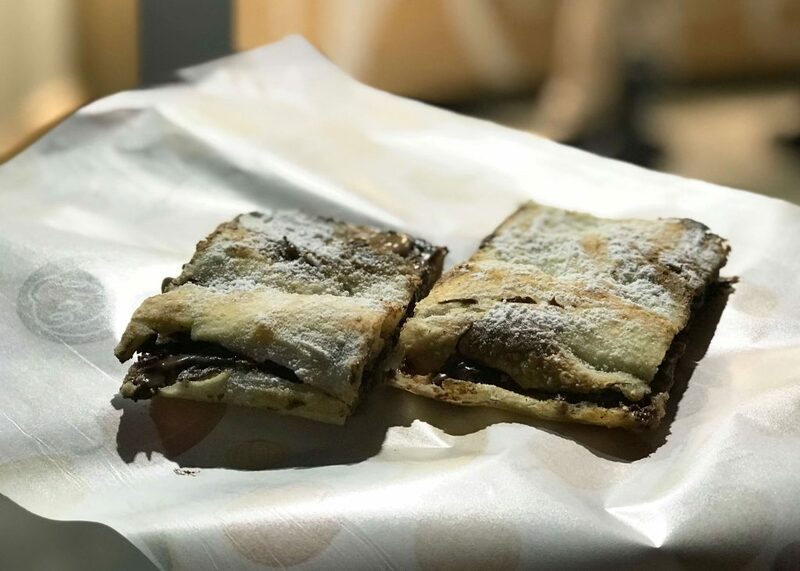 You can’t put dessert pizza in the same competition with non-dessert pizza … especially when that dessert pizza involves gooey Nutella and powdered sugar! Technically, this section should have been placed before the PASTA section as that is what antipasti means: before the pasta. The best way I can describe this is to ask you to imagine an appetizer party: a party where everyone brings one appetizer and you put them all together and graze on the variety instead of having a meal. But that doesn’t work either because antipasti is just what’s before the meal. 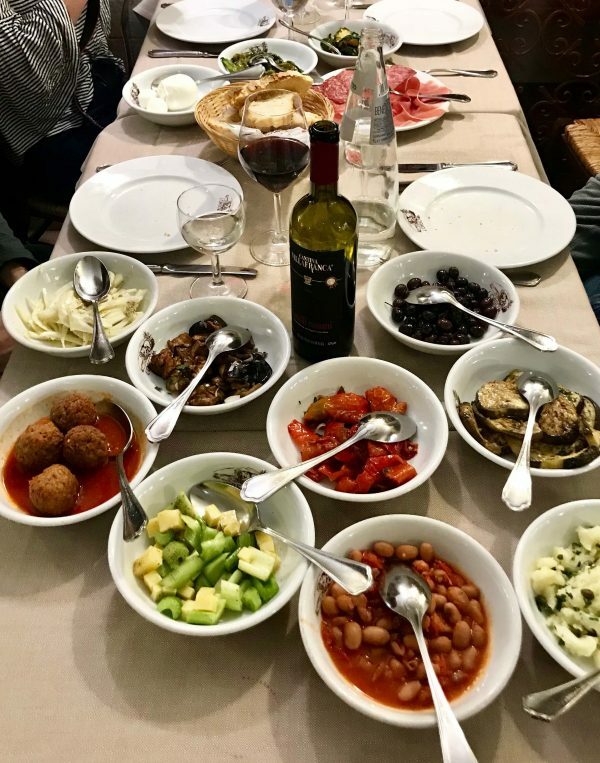 We experienced this phenomenon twice on our trip: a parade of small plates filled with marinated and/or roasted vegetables, cheeses, prosciutto and salumi, meatballs, beans, breads, and olives. I appropriately call it a “phenomenon” because they actually expect you to eat a main course (or two) and dessert afterwards. LESSON: Let’s say there are four of you at a table and you manage to order antipasti. If the waiter asks if you want antipasti for 4? Or for 2? Go with 2. 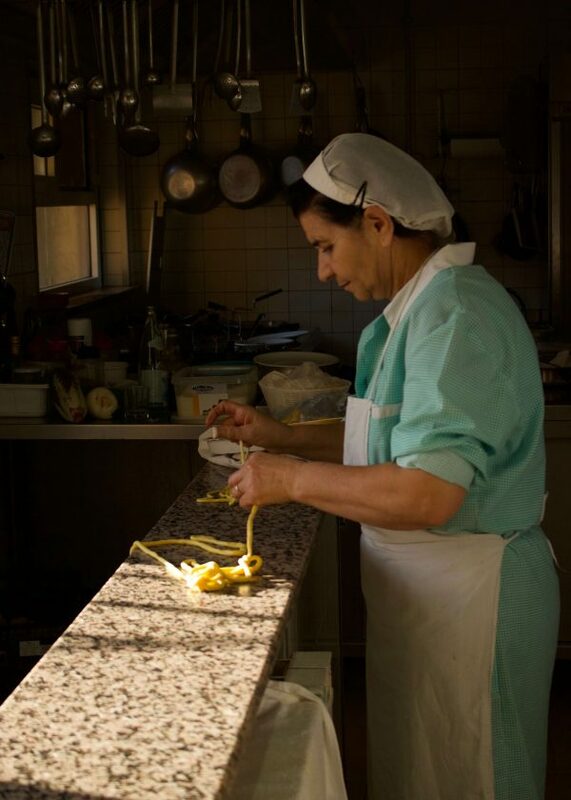 If, after you have given the antipasti your best effort, he/she asks if you are ready for pasta, and you say “a little”, you will still get more than you can eat. True story. This is a good time to introduce the equivalent of to go: “take away”. 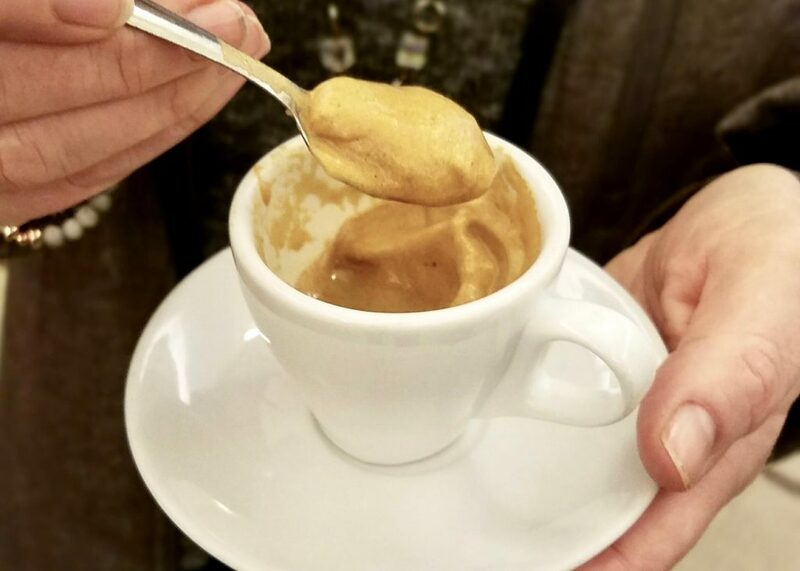 When I ordered my first morning caffe latte, it didn’t even occur to me that it might not come in a disposable cup … and it didn’t. LESSON: The proper way to order something “to go” is to say “take away”. Apparently the only thing more eye-roll worthy than forgetting to mention that you wanted “take away” is to then not care if they pour your latte from the ceramic cup into the disposable cup, completely disturbing the froth factor. I would have thought it was quite apparent I just needed some caffeine! If “to go” is replaced by “take away”, what’s the equivalent for “doggie bag”? Would you be brave/stupid enough to ask? Awww, you know me so well! 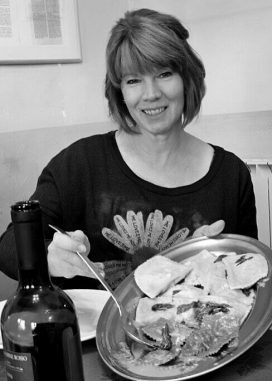 On one of our day trips, we were treated to a private meal at a restaurant/bed and breakfast north of Rome. This beautiful place in the country is run by the most hospitable couple who happen to be in their 70’s but with energy that puts my day-to-day efforts to shame. This was the site of our first experience with the antipasti phenomenon, followed by savory crepes, ravioli, and a large platter of pasta. When we didn’t empty those plates/bowls/platters, we were asked if we were ready for the next main dish or if we wanted to move on to dessert. 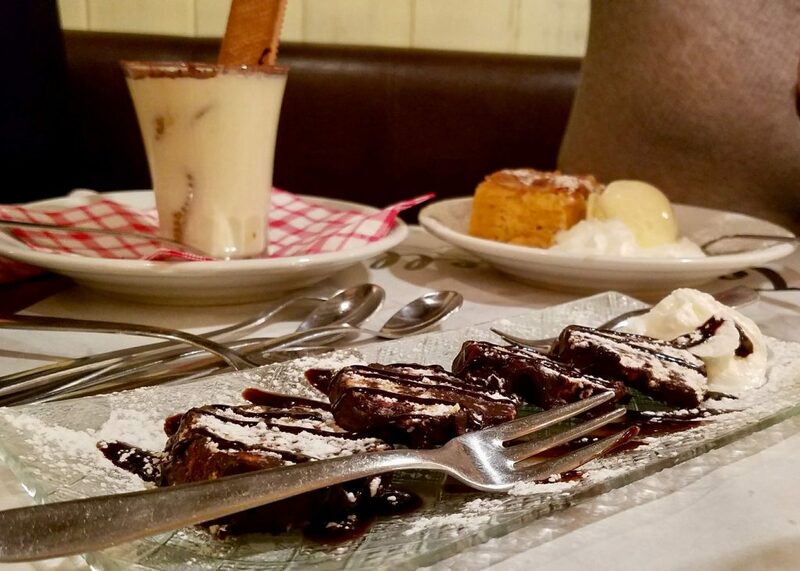 We opted for dessert as we were already quite satisfied (i.e. stuffed). What we didn’t know until later was that they had prepared a suckling pig for us and we were too full for it to even make an appearance. I could tell that Giuseppe (that absolutely was his name) was disappointed that we hadn’t even finished the pasta and afraid maybe we didn’t like it. The idea that we might leave this sweet couple with anything but appreciation and admiration was not something I could do. So I asked our guide, if it was appropriate to ask for a “doggie bag”? I knew I was risking a faux pas … AGAIN … but I’m pretty sure Giuseppe understood immediately because his face brightened and his shoulders squared and off he went. We were soon on our way, after dessert and grappa (an after-dinner drink referred to as “rocket fuel”) and espresso, with a bag of “take away” containers that would serve us well back at the Airbnb later in the week. Trick question. 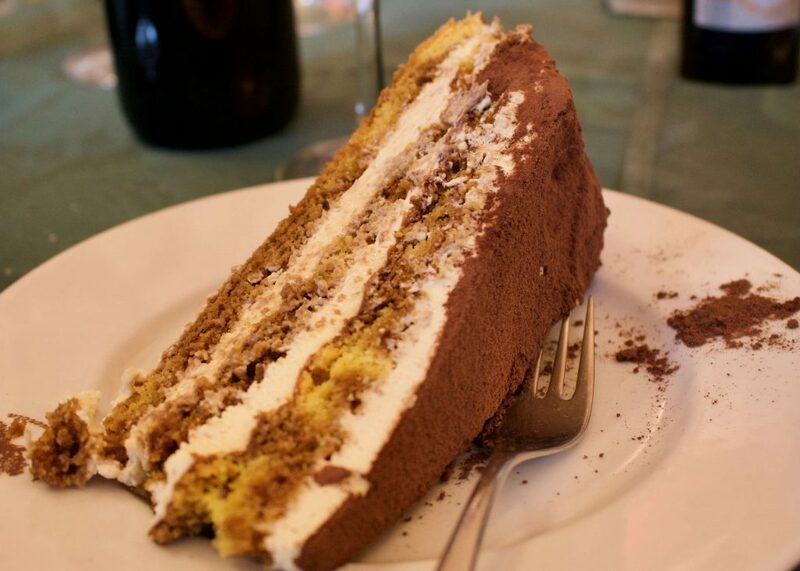 Yes it’s a traditional Italian dessert. Yes, it’s delicious. But it is far from the only option. I still had it three times in the week I was in Rome. Three times … three completely different versions … all amazing! Let me introduce you to my new friends: gelato, chocolate salami, and ciambelline al vino. 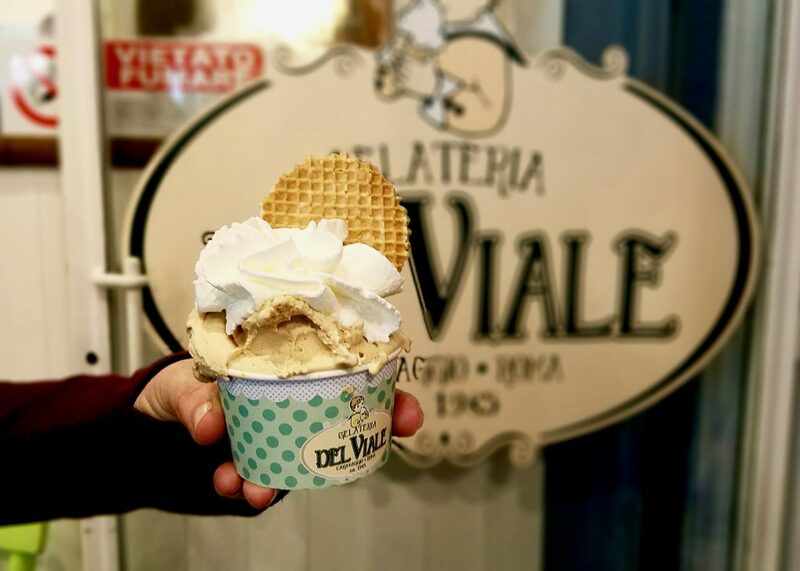 LESSON: Be careful when choosing a Gelateria. 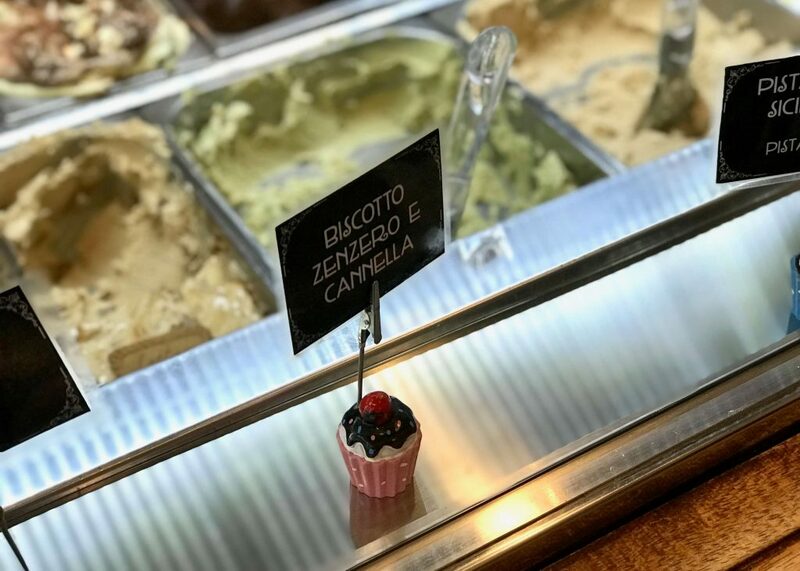 If you look at the gelato display and you see colors not known to nature or big, billowy mounds of “gelato”, keep going. The best advice we received was to think about banana gelato: what color is an actual banana? Not the peel … the banana. Well made banana gelato should be almost white, not neon yellow. I’m going to miss you, speculoos gelato! Chocolate Salami sounds like an oxymoron or an evil trick but it is not. Imagine fudge, with nuts, dried fruit, and even cookie bits, rolled into a log, dusted with powdered sugar, and tied with kitchen string to look like a salami. It is then sliced for serving with whipped cream and, if you’re lucky, drizzled with more chocolate. This picture conveys how decadent this dessert is but to get the full effect, check out this website with the recipe that I will be trying in the near future! Ciambelline al Vino, or sweet wine pretzels, grabbed my attention (and heart) when presented to us as part of our dessert with Giuseppe (mentioned previously in the take away/doggie bag incident). Beautiful, doughnut shaped cookies sprinkled with sugar were passed around and, luckily, before I could try to take an enthusiastic bite, I was warned that these are very hard and meant to be … wait for it … dunked in your wine! Not only are they made from wine, they are to be eaten with wine! Apparently, for a number of the members of my family, it is the addition of anise seed. I am not a big fan of the flavor of anise (or anything close to black licorice) but it did not bother me one bit in these cookies. It was not something that they would choose to have again. But the beauty of trying these things and liking at least part of it is that you can adjust the recipe. Instead of anise, perhaps I will use cardamom … or nutmeg … or allspice. 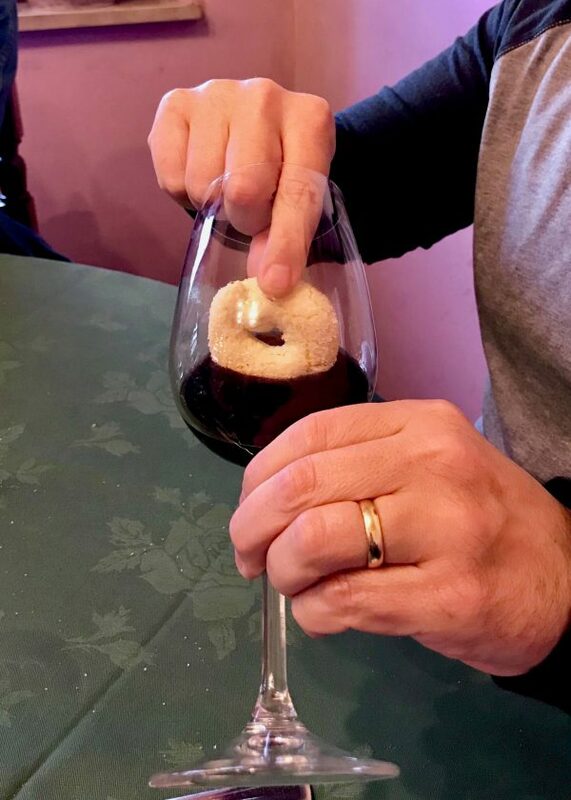 LESSON: If you are going to try to make a cookie that is meant to be dunked in your wine, make sure you make it small enough to fit inside the glass!